It’s not your usual summer camp. For the 50-plus young volunteers from across the country attending last week’s session of Camp RHINO, the only athletic program involved stooping to weed crops at the Edible School Yard, and the nearest thing to arts and crafts consisted of painting walls at Eden House. In between they stocked food bank shelves and worked with mentally challenged adults. Today, another group of campers is attending the final of four one-week summer sessions created by St. Charles Avenue Presbyterian Church as an outgrowth of its post-Katrina RHINO (Rebuilding Hope in New Orleans) program. The adult version has brought more than 5,000 volunteers to the city, initially to gut ruined houses and, in the past few years, to build more than a dozen new ones. Campers weed crops at the Edible School Yard at Green Charter School, where a marker inside shows the depth of Katrina flood waters. “We saw what a difference RHINO was making in the community, and felt this was a way to open it to a new age group, while expanding the mission,” said RHINO project manager Avery Strada. 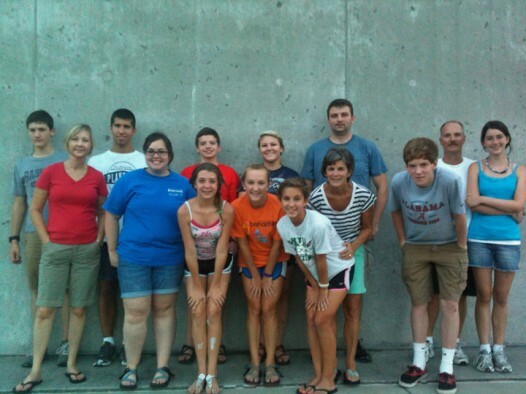 Planning for Camp RHINO began last fall, with a church focus group brainstorming ideas and activities. Participating institutions and ministries signed on readily, says Strada, and as soon as the sessions were announced, they filled up quickly. Campers have arrived from Texas, Georgia, Alabama, Michigan, Kansas and Florida. Next year, Camp RHINO will expand to six one-week sessions. Campers do service work for seven hours each day, and are housed at local universities. Meals and transportation are provided by the staff at St. Charles Avenue Presbyterian. Work sites all are located in areas affected by Hurricane Katrina, and chosen for messages not of destruction, but rebirth. Wherever they go – Magnolia School, Eden House, Second Harvest, the Sculpture Garden at City Park – students hear from directors and staff about background and why the work they are doing is needed. Campers wield paint and hammers, but the broader lesson is about rebuilding hope. Evening programs are designed to put the volunteer activities in perspective, with a focus on urban issues such as education and poverty, how they impact cities, and what can be done to create positive change. Talk might drift to charter schools or transportation concerns, community gardening or “food deserts” – neighborhoods not served by grocery stores. “We focus on urban issues that occur everywhere, but that were exposed by Hurricane Katrina,” said Strada. A highlight for many campers is the prayer tour, a two-hour outing to stops such as the Lower 9th Ward, various charter schools, Habitat houses at Ferry Place and Musicians Village. Participants are asked to be contemplative and reflect on what they are seeing. Like any camp, this one is fun, too. 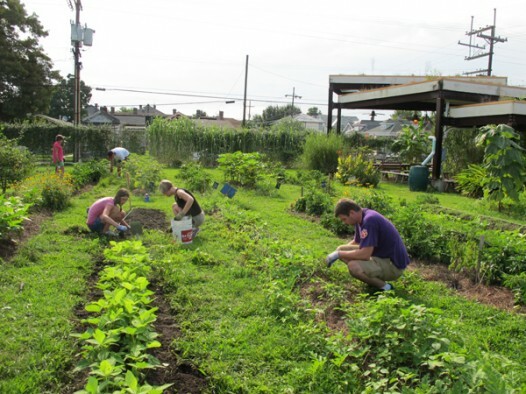 Participants learn jam and jelly making at the Edible School Yard, have pool parties at church members’ homes, attend a Thursday-night dance and enjoy free time to explore the French Quarter and beyond. Camp packets include favorite restaurants, streetcar information, places to see. But the idea is to send young people home not with sports medals or plastic lanyards, but lasting memories. To that end, campers are required to write letters about what they have seen and experienced and how they were affected by it. In a couple of months, Strada will mail each person his or her letter, as a reminder of lessons learned. Another camper already has been back to New Orleans on vacation with her family, and spent a day volunteering at Magnolia School, where she had worked during Camp RHINO. “It’s hands-on work, but everywhere they go, they are told how they are bringing hope to the city,” said Strada. Renee Peck is editor of NolaVie. Footprints: An interactive public art map Kelley Crawford, Steven Melendez, and Emma Fick worked together to create a custom interactive public art map for New Orleans. This project was made possible through a grant provided by EPNO (Emerging Philanthropists of New Orleans)! Take a walk and click away! ViaNolaVie: How it all started Like all successful partnerships, ViaNolaVie started with a shared idea, a mutual need,... Walk a mile: James Chamberlynn McGriggs combine her love of illustrating with her love of people in this series "Walk a Mile." She interviews people who are marginalized about their everyday, and then translates their interview into an illustrated series. First up is is James who wants to be "jolly as hell."